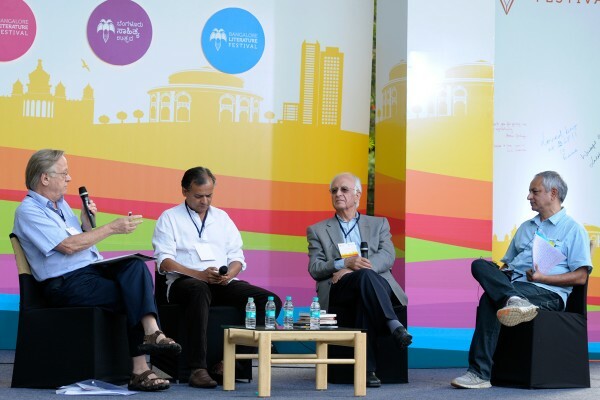 Home / BLF Live / BLF 2014 Reports / BLF 2014 Reports Day 1 / Getting Down to Business- Can India Change its Mindset? Getting Down to Business- Can India Change its Mindset? The session opened with Moderator Sumit Chakraberty bringing up the new ‘’Make in India” campaign, launched by new Prime Minister Narendra Modi which seeks to create India’s manufacturing prowess in 25 new sectors. The once towering steady elephant was replaced by the symbol of the lion, the official new logo that seeks to exude power and vitality. But what were the panelist’s impressions? Across the board, they agreed the shift in PR strategy is a great move. But when it came to Jugaad or the specific Indian-brand of innovation, there was quite a bit of debate over definitions. Should we really call innovation jugaad at all? In John Elliot’s book Implosion: India’s Tryst with Reality’, jugaad is mentioned quite often as making the most of frugal resources. While the word has become quite a fad, however, it also exudes a lack of systems, processes, and institutions that can sustain and support innovation, thereby cheapening India’s image in this light. As the session progressed, the discussion meandered around understanding the Indian mindset when it comes to innovation. A dated presumption is that it involves a lot of R&D, a lot of scientists, and a lot of papers. This belief was also supported by a wide held view that you had to be a certain size to be successful or survive. At the same time, however, there are many layers to mindsets. The very central one, relating back to re-branding a la Mr. Modi, is to be connected to our immediate neighbours – unlike our earlier focus on shining before the eyes of USA. “The change in mindset now is to discover who we are and what we want. There’s clarity about the good things and the things you don’t like about the relationship with others [countries],” remarked Arun Maira. “I wondered why he said it and don’t understand what he meant. You don’t want foreigners to invest here or you want Indians to invest here? FDI is a grossly overrated component of measuring growth. It’s important for capital and technology but basic problem is that Indian businesses are not investing. They need to loosen up, know that the government is working, and that there’s continuity,” observed Elliot. He contends Modi’s changed the image of India’s foreign policy but needs to come back and firm things up, appoint ministers, make sure bureaucrats are taking decisions. There are a whole lot of problems that need working on. Arun Maira drew references from his book Redesigning the Aeroplane and asked if there was a need to reconsider what we consider important. “If I care about sustainability and inclusion, I would need a measure for it. I care about those things because my economic results won’t keep coming out much longer. We can’t be having single measures and expect to be integrated into a system. We have to redesign our measurement cards. We’re in a stage where we know we have to do different things and do things differently and in doing that we get challenged. People want reforms for institutions, business people, however, want no change” he suggested.